 LIKE A PRO! Solo volleyball training aid for all experience levels beginners to experts. Easily practice arm swing motion techniques and tosses multiple times. Simply warm up your serve and improve your serving skills. Spend more time HITTING the balls and LESS time chasing the volley ball with the rebounder elastic cord.  SIZE ELASTIC CORD! This strong adjustable elastic cord gives your the right height for an overhand a serve. The smooth action glides the ball back to the player every time.  DURABLE BELT! From youth to adult, the stretchable belt can fit anyone waist comfortable. It can be adjusted for anyone waist size.  ANY SIZE VOLLEYBALL! Securely fitting any Indoor and beach volleyballs. Can be place in pouch to practice and train. It can even hold basketballs, footballs and soccer balls. Strong and durable velcro straps.  GUARANTEE IT! 100% Satisfaction Guarantee. We stand by the quality of our products, which we why we offer a 100% money back guarantee if you are happy with your Ace Pal. For all ages kids and adults. GREAT FOR SOLO TRAINING: With the aid it becomes very easy to practice arm swing technique and tosses multiple times in a row. The elastic cord guides the ball back after every swing. No need for interrupting the training in order to fetch the ball. Multiple fast repetitions in a row get you in a state of flow: this makes it easy to perfect technique through quick feedback. ADJUSTABLE CORD LENGTH: Elastic double reinforced cord is adjustable in length. For optimal serve training we recommend finding the optimal height for your height and adjust the cord accordingly. It can be adjusted up to 5' 9'' (1.8m). COMFORTABLE AND SIZE ADJUSTABLE AROUND WAIST: Velcro strap fits comfortably around waist. It can be adjusted to accommodate different waist sizes up to 2'6'' (80cm). FITS ANY VOLLEYBALL: Neoprene pouch with adjustable length holds standard volleyball or beach volleyball. It could even hold soccer, water polo or basketballs. This pouch is attached to an elastic cord that is attached to the velcro waist strap. PRODUCT HIGHLIGHTS Made with premium material, designed by senior designers, our stylish volleyball training equipment aid can not only improve your skills, but also make you cool while practice. The elastic string is perfect to bungee the ball back. It is unnecessary to waste time to chase the ball during training. You are able to FEEL the right technique and develop muscle memory within a short time With the help of the training tool, you could practice the volleyball skills by yourself, like serving, spiking and setting. Besides, you can practice in the house, backyard, and garden despite weather conditions. MATTERS NEED ATTENTION Hitting the volleyball with tremendous force for long periods (more than 2 hours) can put too much stress on the elastic and cause it to break. The exercise tool is thus best suited for beginners and younger players to find the optimal serving, setting, and spiking technique. Don't aim at objects or people. This bundle is designed to solely focus on improving your game performance. The serving training aid ensures that you can improve your serving, spiking and setting while not having to chase the ball after each hit. This improves the efficiency of your practice sessions. The setting straps aid ensures that you can practice your setting technique with the right-hand form when setting the ball. The ball in the middle of your hands prevents you from using your palms thus using only your fingers. The finger resistance bands increases you hand and finger strengths, which will be beneficial when blocking the volleyball from the opponents. Reduce your chances for finger injury by increasing your finger strength! Please check your email regarding this matter. Can't find it? You have further questions? Please contact us. We would love to help you. For measurements regarding these training aids, please look at the last photo of the listing or the instruction manual. *This device is suited best for beginner/intermediate players. *Do not aim at people, animals or objects. 100% REFUND GUARANTEE - Regius Products is committed to customer service and maintains a 100% refund GUARANTEE, no questions asked. Please send us a message if you have any questions or concerns. HELPS SOLVE COMMON PASSING ISSUE: Teaches proper passing technique to prevent excessive upward arm movement. EASY TO USE: Use durable elastic band that attaches to passer's wrists and ankles to prevent excessive upward arm movement in volleyball. LOW PROFILE: Small, lightweight Velcro wrist cuffs were designed to minimize ball contact interference. ADJUSTABLE DESIGN: Elastic band is adjustable to accommodate any passer's height. HELPS SOLVE COMMON PASSING ISSUE: Teaches proper passing technique to prevent excessive upward arm movement. ADJUSTABLE DESIGN: Elastic band is adjustable to accommodate any passer's height. 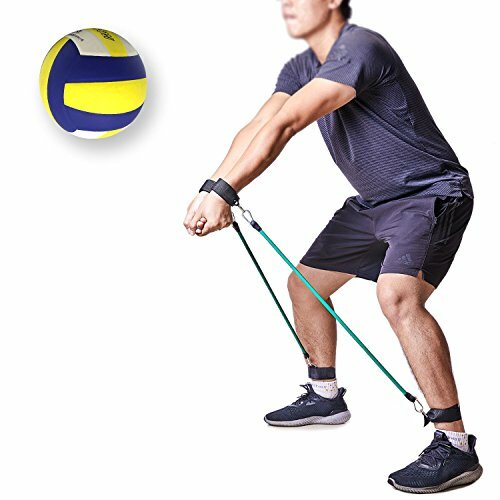 EASY TO USE: Utilizes durable elastic band that attaches to passer's wrists and ankles preventing excessive upward arm movement in volleyball. LOW PROFILE: Small, lightweight Velcro wrist cuffs were designed to minimize ball contact interference. Ace Assistant's Volley Ball Rebounder, The Ultimate Solo Volleyball Training Equipment! Spend MORE time hitting Volley Balls and LESS time chasing them! The Elastic Tether increases your warm up and conditioning reps by returning the ball to you after each strike. Why Buy The Ace Assistant Ball Rebounder Gear Over The Competition? Our elastic tether adjusts up to 75 inches long, 23 inches longer than the leading competition. That means you can practice your form on full arm swings or even tossing up overhand serves without the cord tangling or recoiling into your face - avoiding that "six-pack" effect. NEW & IMPROVED JULY 2018 MODEL features a heavy duty buckling clip and 1-inch thick elastic tether, more than double the thickness of the competition. So, you'll get more reps in without your Ball Rebounder snapping or breaking. - Reinforced 1-Inch Thick Tether can withstand heavy use in a variety of sports facilities, indoors, outdoors or at the beach! - Ball Tether Rope adjusts from 40 - 75 Inches. - Ball Pouch accommodates all Volley Ball sizes, from youth to adult, indoor and beach balls. - 40 Inch Adjustable Velcro Waistband fits all waist sizes from girls to boys and adult men to women waists. - Makes a great Volleyball gift for your boy or girl! Each Kit Includes A Drawstring Travel Bag And Our Instructional eBook, "How To Hit A Volleyball: Discover The Top 3 Methods"
You'll Learn the most important hitting techniques, including the Underhand Server (for Beginners), Overhand Serve (for Intermediate/Advanced) and Bumping (for All Experience Levels). Buy with confidence knowing your purchase is backed by Ace Assistant's 100% Satisfaction Guarantee & Lifetime Warranty! Now Step Your Volleyball Skill Up By Increasing Your Practice Serving Reps With Your Own Volley Ball Rebound Trainer! PERFECT SOLO VOLLEYBALL TRAINING EQUIPMENT FOR ALL EXPERIENCE LEVELS - Whether you're a beginner or a seasoned pro, the Volley Ball Rebounder is a great Practice Aid to rapidly improve your Volleyball game skills or simply warm up before your match. You'll spend MORE time hitting Volley Balls and LESS time chasing them with the durable Elastic Bungee Cord acting as your ball buddy. REINFORCED GEAR, EXTRA LONG TETHER ADJUSTS FROM 40-75 INCHES - Adjustable Elastic Cord gives you ample length to even hit Overhand Jump Serves and Spikes without the ball bouncing back into your face. UPGRADED JULY 2018 MODEL reinforced with a 1 thick tether, more than double the thickness of the competition! FITS ALL VOLLEYBALL SIZES - Ball pouch is made from Velcro and Neoprene, securely fitting a wide range of Volley Ball sizes, including: Youth, Adult, Indoor and Beach Volleyballs. 40-INCH LONG ADJUSTABLE WAISTBAND - From youth to teen to adult, the stretchable Neoprene belt and Velcro waist band is sure to fit anyone's waist comfortably. 100% SATISFACTION GUARANTEE, LIFETIME WARRANTY - Buy with confidence knowing that if you aren't happy with your purchase, or experience any issues, we're here to help with Hassle-Free Refunds and/or Replacements. BONUS ACCESSORIES: DRAWSTRING TRAVEL BAG KIT AND AN EMAILED COPY OF OUR VOLLEYBALL INSTRUCTIONAL EBOOK INCLUDED - Hey Volleyball mom! What a great sports gift for your girls and boys! 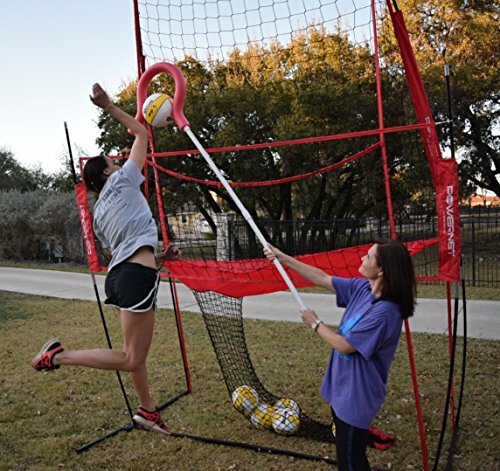 The Park & Sun Spectrum Precision Trainer Adjustable Target Net is an adjustable and portable volleyball target trainer that is also an excellent training option for football, soccer and many other sports. This trainer features a sturdy steel two-piece frame that is connected to a target with a catch net that attaches to the target with Velcro straps. This trainer can be used for many sports, but it is especially perfect as a training aid for volleyball, specifically for bumping, passing, setting and spiking. The target hoop angle can be adjusted to 45, 90, 135 or 180 degrees. The target hoop features adjustable heights of 76", 106", 114", 122" and 130" measured from the center of the target hoop. By enabling this adjustability in angling and height, the training aid allows users to better adjust for different in-game situations. The sturdy welded steel frame measures 44" x 30" x 43" and is designed to be completely stable, even under attack from viciously spiked volleyballs. Front rubber swivel wheels allow this trainer to be moved and transported easily. The trainer also includes a telescopic and adjustable aluminum support system. 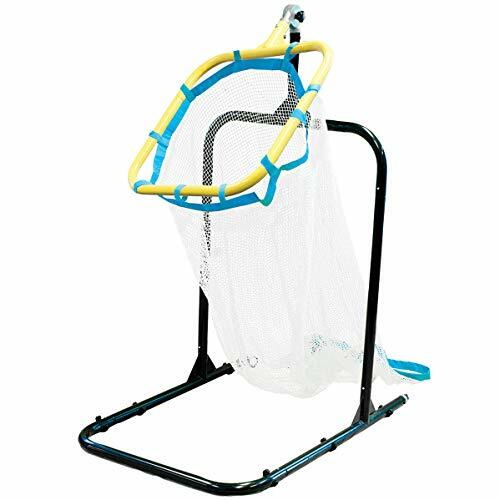 The catch net effortlessly attaches to the hoop target with Velcro straps so users don t have to run after their ball after every bump, pass, set or spike. A team lives and dies by its ability to set for the scorers. 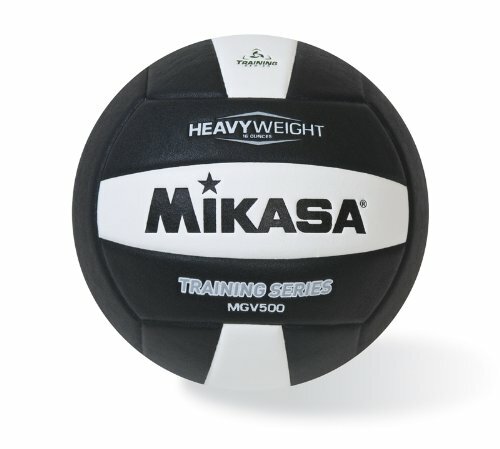 To aid in the development of that special skill, we present the "Heavy Weight", part of the Mikasa Training Series. Weighted to 16 oz., it strengthens muscles and hones your accuracy without sacrificing the quality you expect from Mikasa Sports USA. The "Heavy Weight" ball features a long-lasting cover and soft-built fabric center so you never lose the feel of the game ball. Specs: Official size and heavy weighted to 16 oz. Composite cover. 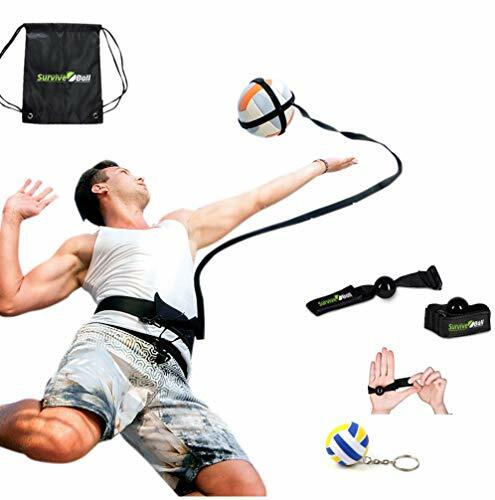 GREAT FOR BEGINNERS & EXPERIENCED PLAYERS - Our volleyball self sever is an excellent training addition for any budding volleyball player, an essential accessory to master those early volleyball skills. The elastic durable cord will rebound the ball back to you removing the need for a trainer or additional person. With this fantastic training aid you'll move from a newbie to a pro in no time at all. BONUS EBOOK INCLUDED - Win with your mind - not just your body. The panther sports best selling bonus ebook educates you on volleyball tactics and rotations. We are proud to offer you a truly exceptional product which will enhance both your physical and mental volleyball skills. Smart Spike Volleyball Training Aid. Jump Higher. Hit Harder. Beginner & Professional. Fun Innovative Tool to Gain Confidence in Attacking the Ball. Give the spiker a perfect set every time. Jump Higher and Hit Harder! Great for Teaching Proper Technique: Arm Swing Extension Approach - Use for: Home Practice Team Practice Camps - Lightweight: Less than 2 lbs. - Durable: PVC Pole and Quality Foam Ball Holder. - Safe: Foam Covering to Protect from missed hits. - Convenient: Breaks down to less than 3ft. for easy transport. Personal testimony: After practicing with the Spike Stick for 3 days my 11 yr. old daughter had three spikes in her next game while having none in the previous 7 games. It gave her the confidence needed to attack the set instead of just bumping it over. There are similar products out there for hundreds of dollars that do the same thing and are advertised as being used by the US Olympic Volleyball Team. One could purchase Spike Sticks for the whole team for what one of those products cost. DURABLE REBOUNDING VOLLEYBALL TEATHER: Train solo to improve your skills at serving, spiking, digging, and setting in your own backyard without the need for a large gym, hard court, or volleyball net. FULLY ADJUSTABLE WAIST & WRIST STRAPS: Soft neoprene and velcro straps safely and comfortably fit men and women of all ages. Strong elastic cord allows you to focus on technique without chasing balls. FITS TRAINING & REGULATION VOLLEYBALLS: Strong webbing securely holds soft oversized training volleyballs or regulation size balls to allow a wide range of drills for different players skill levels. CONVENIENT EQUIPMENT STORAGE BAG: Drawstring travel bag easily stores in your gym bag so you can take your hitting and serving trainer to the school gym, local outdoor volleyball court or beach nets. ONE YEAR NO QUESTIONS ASKED WARRANTY: In the unlikely event that your serve or spike outpowers or wears down your training teather simply return the rebounder for a no questions asked replacement. 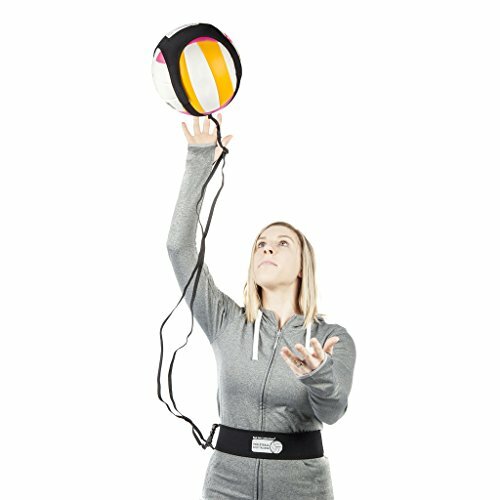 The latest sports solo waist trainer - No more chasing the ball after every serve just to realize that you have drained all your energy after 2-3 serves only - focus more on Serve, Spike, Arm Swings & Hitting, and let this waist strap trainer do the magic of bringing back the ball after every toss, thus saving you energy for the real practice. -Don't worry about being alone in practicing your volleyball game - practice solo with your new training aid & improve your game. -Serves, spikes, pass, attack, drills & arm swing - practice various technics to complement your determination & player spirit! -Practice your exercises indoor, outdoor, at the beach or anywhere you can find a suitable space - portable system for an easy workout session! 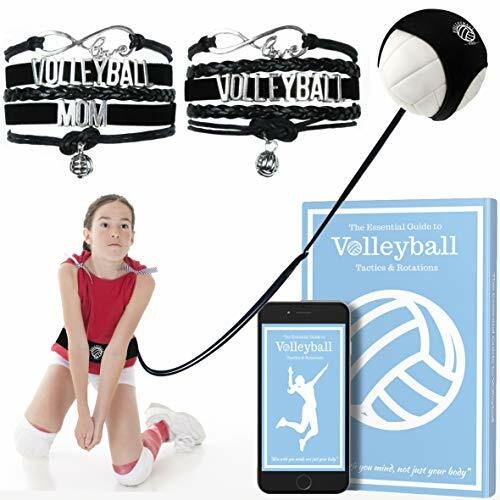 -Easy to use design - put the volleyball in the neoprene sleeve, tie the Velcro waistband around your waist & connect the elastic cord to the waistband & sleeve - your simple sports pal! -Convenient & comfortable to use durable coaching equipment! 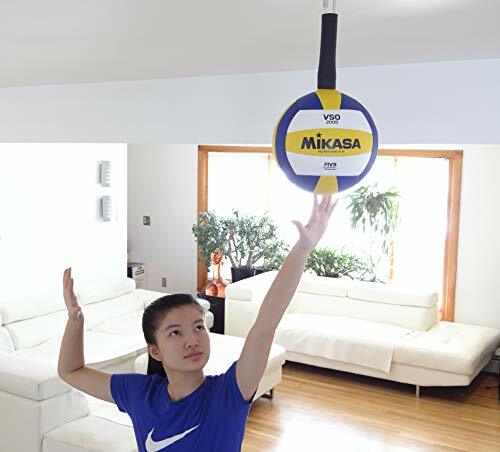 -Can be used as a basic form device for volleyballs, beach volleyball, soccer & basketball. -Suitable gift for boys, girls, women & men. 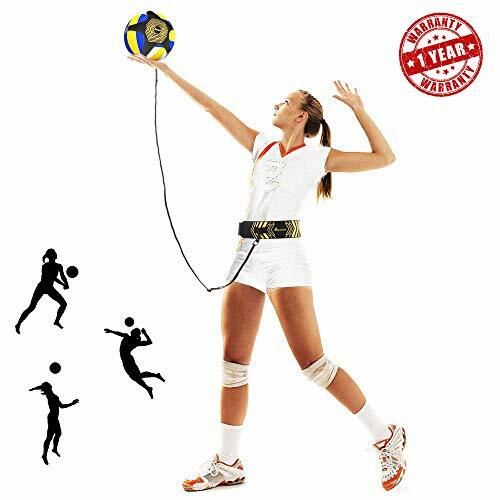 ORDER & Get this Incredible Volleyball Trainer NOW!  PREMIUM QUALITY - Soft waist band feels comfortable & doesn't annoy, strong & durable hook doesn't fall apart like inferior ones, and our quality neoprene and malleable cords can easily strenght the forces of the game - definitely an outstanding volleyball hitting trainer or volleyball spike trainer. 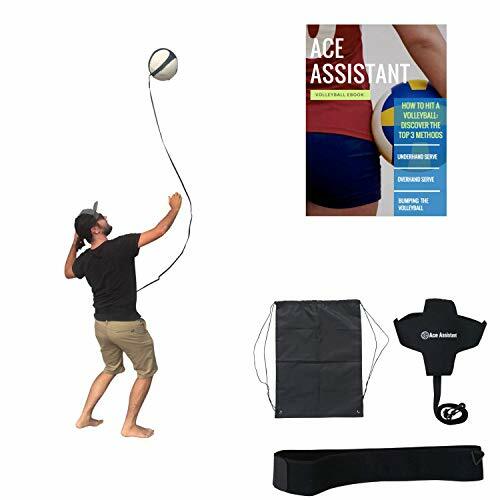  COMFORTABLE AND SIZE ADJUSTABLE AROUND WAIST - Velcro waistband conveniently fits around waist, adjustable neoprene pouch can go for any standard or beach volleyball, and with two distinct cords (60 in. & a 100 in. cord BONUS), it suits every build & skill level - amateurs or experts.  LONGEST AND WIDEST ELASTIC CORD FROM AMAZON - Everyone says they have the longest cords on Amazon. The truth is we have a basic 60 in. cord and a 100 in. BONUS CORD. When used the cord can extend up to 300 in.! We provide the BEST quality! Test it! 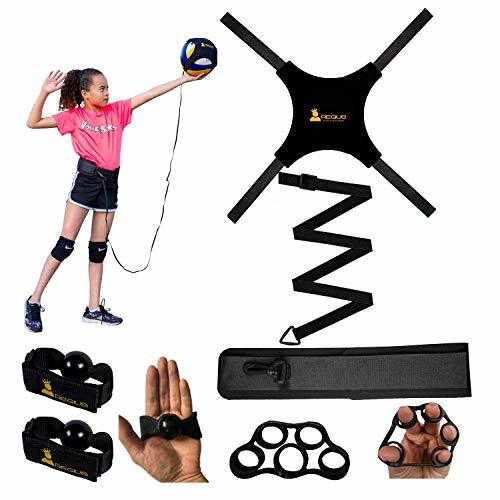 A Great Solo Trainer which helps you Practice and Perfect your skills such as Setting and Spiking, Serving Overhand or Underhand, Arm Swing and much more. 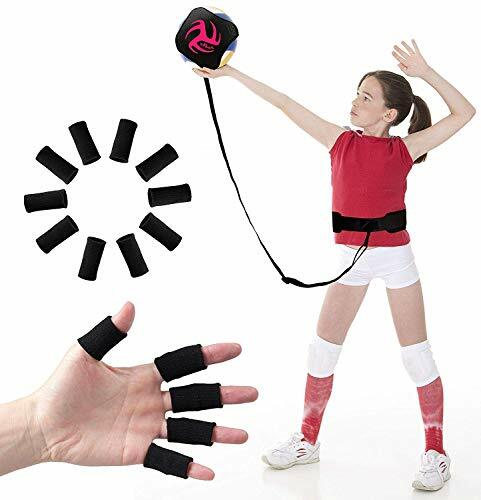 This infiiniity volleyball training aid is carefully made with Premium Quality Waist Belt and Elastic Cord with Extra Strong Velcro. It brings the ball back to you rather you chasing it which saves time. This trainer could be your Best Volleyball Training Pal. No Matter what experience level you have, this could be a YOUTH, ADULT or PROFESSIONAL TRAINER. It comes with a Small Mesh Bag & the whole kit can be nicely fold & kept in this Mesh Bag afterwards. You can buy it for yourself or as Practical Gift to your love ones or a Dozen for the whole team to use it either Indoor or Outdoor. This training Gear is fun everywhere. 1 x Elastic Cord/Tether attached to the Velcro Attachment on one side and connecting hook on the other side. 1 x Ball Holding pouch. 1 x Small Mesh Bag. Elastic Tether/Cord un-stretched; Adjustable from 50 to 100 Inches. Waist Belt Length un-stretched; Adjustable from 22 Inches to 42 Inches. Waist Belt width; 3 Inches. Ball Pouch; 16 Inches with 5 Inches Velcro Strongly Stitched within all four sides. Ball pouch attachment stitched to Cord length; 17 Inches. Mesh Bag Case; 7 x 6 Inches. NOTE: Volleyball is not included. Perfect Practical gift for Volleyball Lovers. STRONG & ADJUSTABLE ELASTIC CORD : Our Volleyball Training Equipment Aid has a LONG and STRONG Elastic Cord which can be adjusted according to your needs. This training kit brings the ball back to you after every swing so more time to FOCUS on your SERVING, SPIKING, SETTING etc. This makes it a Great Reliable Training Pal. It comes with a 6" x 7" Soft Mesh Bag to keep the kit together after use. PREMIUM QUALITY : This Solo Trainer has a Premium Quality Neoprene Waist Belt with LONGER VELCRO and STRONG STITCHING. The Tether/Cord is made up of High Quality Elastic and the Ball Pouch has EXTRA LONG VELCRO stitched inside which firmly hold the ball. The Cord is also stitched within the ball pouch attachment without any knot which makes it easy to practice your Serving, Setting, Spiking etc. SUPER SOLO VOLLEYBALL TRAINER : It has SIMPLE but SMART Design, made up of Light Weight materials and it fits ANY SIZE VOLLEYBALL. It helps you to IMPROVE your PRACTICE and PERFECT your Volleyball Sport Skills such as Overhand Serving, Underhand Serving, Arm Swing, Setting, Spiking, Hitting etc. It saves you time by bringing the ball back to you on each and every swing rather you running after it. MEASUREMENTS : Elastic Tether/Cord un-stretched; Adjustable from 50 to 100 Inches. Cord width; 0.78 inches. Waist Belt Length un-stetched; Adjustable from 22 Inches to 42 Inches. Waist Belt width; 3 Inches. Ball Pouch; 16 Inches with 5 Inches Velcro Strongly Stitched within all four sides. Ball pouch attachment stitched to Cord length; 17 Inches. Mesh Bag Case; 7 x 6 Inches. Buckle; 2.5 Inches. 100% SATISFACTION GUARANTEE: We aim for 100% Customer Satisfaction. If you are not happy with your purchase, please do let us know. We have carefully selected fine materials for this product and we are confident that you will find our infiiniity volleyball training equipment aid a great value for money. 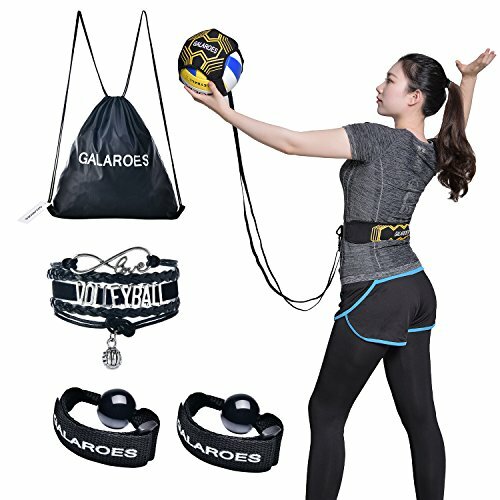 GALAROES Volleyball Training Equipment Aid : Solo Practice for Serving and Arm Swings Trainer - Practice Overhand Serve, Spike, Arm Swings, Hitting. Returns The Ball After Every Swing. ARE YOU TIRED OF RUNNING AFTER YOUR VOLLEYBALL DURING ARMSWING PRACTICE? 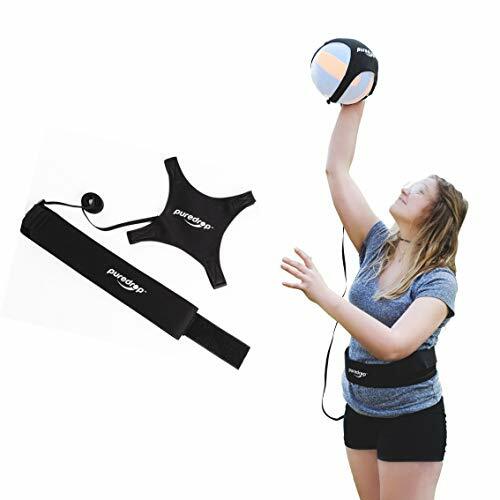 - This volleyball training equipment makes solo training a whole less cumbersome and a lot more fun. Get in a state of flow! With our equipment you can easily swing ten to twenty times a minute with immediate feedback. This makes learning a lot faster and more efficient. Imagine training ten times more effectively than without a return mechanism. Imagine the progress that will be made in such short time! SMART DESIGN ADJUSTMENT SYSTEM - When we designed the Volleyball Star Training Kit we took into consideration all the potential users. All products from Volleyball Training Equipment Aid Kit can be adjusted to fit all ages, from kids to teenagers to adults. Also our ball pouch from serving trainer can fits any size sports balls, can be a football, a soccer ball, even a basketball. We only used top quality materials and durable velcro straps. 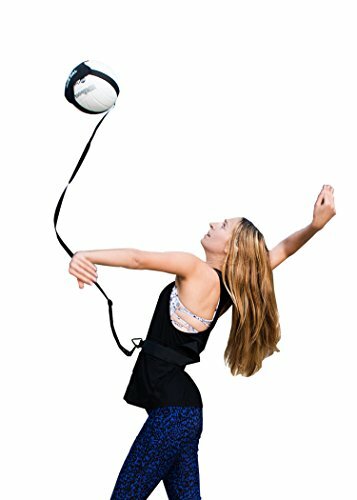 GREAT FOR SOLO TRAINING - With the aid it becomes very easy to practice arm swing technique and tosses multiple times in a row. The elastic cord guides the ball back after every swing. No need for interrupting the training in order to fetch the ball. Multiple fast repetitions in a row get you in a state of flow: this makes it easy to perfect technique through quick feedback. 100% SATISFACTION GUARANTEE -We aim for 100% customer satisfaction. If there are any problems with the product please let us know. We provide easy refund possibilities and timely shipping. VOLLEYBALL FINGER PROTECTION (Bonus) - Our added bonus Volleyball Finger Protection provide adequate compression and cushion for fingers to buffer and reduce sudden impact and enhance grips in sports. Serve as elastic finger support to relieve pain in finger joint, help alleviate ache against arthritis, tendinitis, swollen finger and trigger finger. Dense stitching with composite material(nylon, spandex and gelatin silk), breathable and excellent in flexibility.